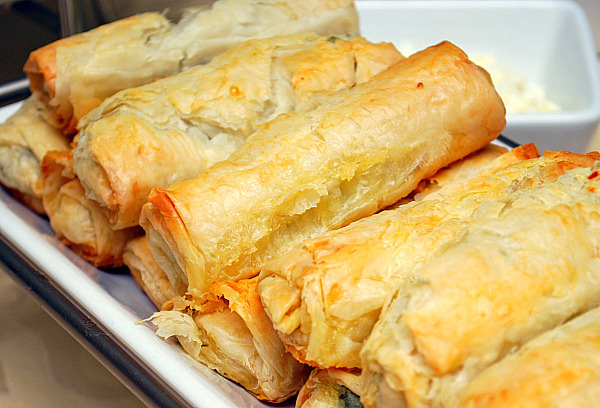 Who can resist anything wrapped in buttery, crispy phyllo dough? It's one dough that may be finicky to work with, but it surely is well worth the effort. But before we even talk about the phyllo dough, the filling is really the star of this dish. A combination of softened white and green onions are added to cottage cheese, feta cheese, and egg. 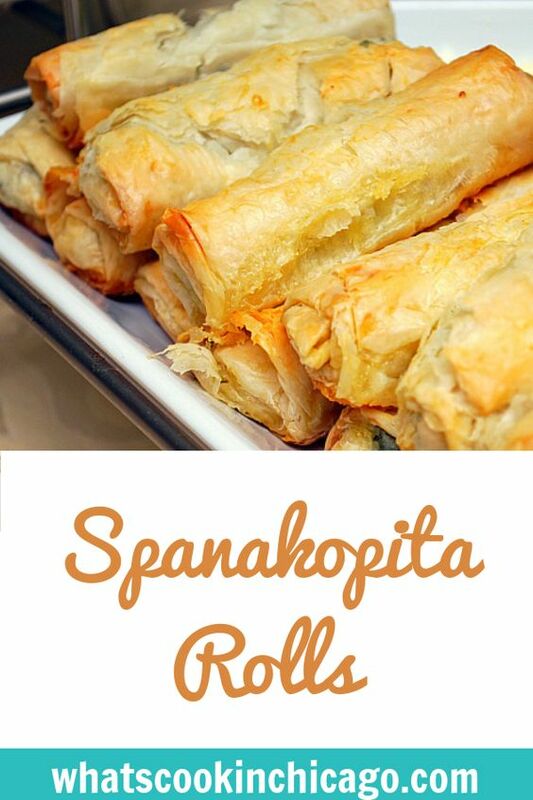 Together it forms the classic spanakopita filling. Once the filling is made, it's time to prepare the phyllo dough. The thing about phyllo dough that may be intimidating to work with is that it dries out quickly and requires lots of butter or oil to keep moist. However the butter butter and oil also helps the phyllo dough to bake up nice and golden with that unmistakable crispy texture. Using a similar technique in making burritos or eggrolls, the filling is placed on buttered phyllo dough sheets and rolled up tightly to form a roll. These are then kissed with more butter and oil before baking to a crispy golden brown. One roll is quite filling as it is and you can even cut these rolls into smaller bites before serving. Heat 1 tablespoon of oil in medium skillet over medium heat. Add white and green chopped onions; cook until softened, 3 to 4 minutes. Meanwhile, mix spinach, feta, cottage cheese and egg in medium bowl. Add cooked onions and season with salt, and pepper. Cover and refrigerate until ready to use. Combine the remaining butter and oil and set aside until ready to use. Remove one phyllo sheet. With the shortest end of the phyllo sheet nearest you, brush phyllo with butter and oil mixture; top with second sheet and brush again. Fold the buttered phyllo sheets in half, like a book and brush the top layer with butter and oil mixture. Place a heaping 1-1/2 tablespoons of filling in the center of the bottom nearest you. Fold up the phyllo once and then fold over the right side and then the left side of the phyllo. Brush with butter and oil mixture and then continue rolling up like a burrito. Place seam side down on a greased baking sheet and brush rolls with butter/oil mixture. Bake until golden, about 30 to 35 minutes. What a wonderfully clever idea! I'm bookmarking this recipe for a future get-together with friends :). My mother and I make them into rolls every time we make them. The traditional triangles are a bit of a pain to get all the same size and stuff. We do the "casserole" style too, although, we use a heck of a lot of filo dough! The best part about making them into rols though is freezing them before you bake them, then being able to pull out a couple of rolls every once in a while to have as a snack whenever. There are some in my freezer right now from a batch made on Easter! I am tired of making the triangles, can't wait to give the rolls a try. Thanks for sharing. I will definitely be making these today for Easter tomorrow, thank you!! Also shared your page and pics on my FB page! !